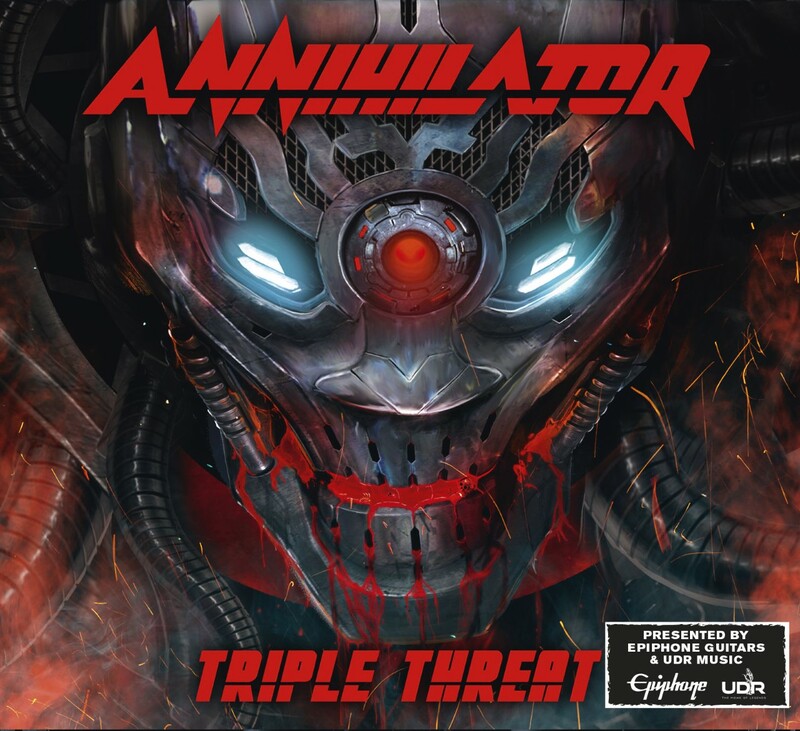 Epiphone is proud to announce that on January 27, 2017, Annihilator--featuring longtime Signature Artist Jeff Waters--will release Triple Threat, a three disc collection featuring acoustic versions of Annihilator classics, a live set from the 2016 Bang Our Head Festival, plus a Blu-Ray DVD of the performance. Triple Threat will be available in several formats including DVD/2CD, Blu-Ray/2CD, and a 2 CD audio-only with digital download. 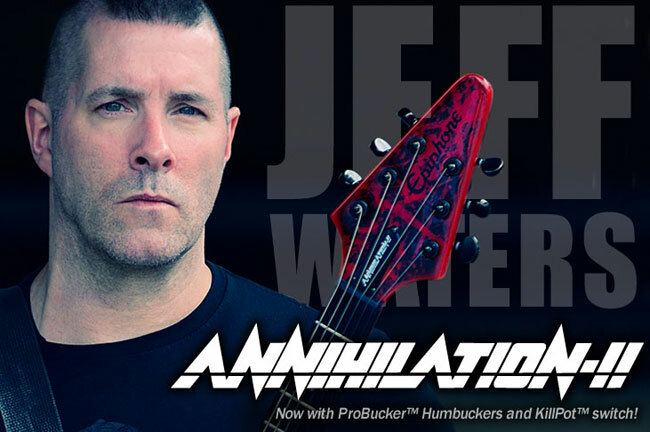 The acoustic disc features Jeff Waters with Annihilator band members Aaron Homma and Rich Hinks plus Vancouver BC drummer, Marc LaFrance and Ottawa session player Pat Robillard. Recorded and mixed by Waters, the quintet recorded all the songs live in single takes at Watersound Studios in Dunrobin, Canada giving Waters one of the most challenging, satisfying and perhaps ‘electric’ creative moments in his career. “This was one of the coolest things I have done in my long career," said Waters. "Having 5 people in a room, from all different backgrounds and talents, coming together to play songs from the past and to try to sound like we are one but totally live and with feel. This was one of the biggest challenges that Annihilator has faced, musically, but what impressed me the most was how you can hear all the individual styles each player has and how we were able to glue the playing and feel together. Done all in one take and with all the musical blemishes and imperfections that I would never normally let slide!" Read our classic Epiphone interview with Jeff on the occassion of his new "Annihilation-II™" Flying-V Outfit which features a custom Annihilation Red gloss color finish designed by Jeff, Epiphone ProBucker™ humbucker pickups, custom Phenolic fingerboard, KillPot™ switch, Grover™ Rotomatic machine heads and a custom-fitted gig bag. "The new "Annihilation-II™" Flying V Outfit is exactly what I envisioned when I challenged Epiphone to come up with an on-par-with-the original Epiphone Annihilation but reducing the cost to the buyer," says Jeff Waters. "I wanted a guitar that most hard rock and metal players could afford with killer, versatile pickups, a nice finish and setup to play either tight, heavy rhythms or fast, screaming solos! Add a new style KillPot™ switch and a "non-slip shred grip" to keep the Flying V from slipping when seated, and you have a guitar I can proudly put my name on!" Visit the Triple Threat website for more info and stay tuned to Epiphone.com for more good news from Jeff Waters!